Ugh! Yet another survey scam has crept onto the scenes and has entered my crosshairs ready to be slain with bullets of truth! Too cheesy? Well you get the point. Survey websites are complete scams and we have another one for you today. More and more survey sites appear on the internet promising people free gifts and money for completing surveys. As you can see in my previous survey review, I don’t like them. They’re a complete waste of time and you’ll barely see any returns for your efforts. MyView is no different. 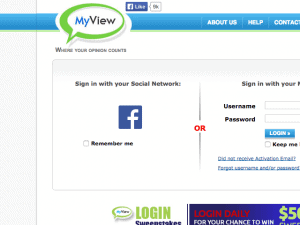 MyView is different compared to other survey websites we’ve reviewed but not in a good way. We’ve looked at Toluna where we showed you that your earnings per hour is shockingly low which was also the problem with the last survey website, Clear Voice. MyView however shocked me from the very start. Hopefully those of you who are regular readers here know to stay away from websites like this because of their low earning potential. Let’s get into the nitty gritty of MyView and you’ll see why I was stunned when I first landed on the site. Very rarely does a website shock me. Frustrate me yes but very rarely shock me. When you first hit the homepage there is nothing there. Just a login/registration form. This is all you’ll see. When you compare that to i-Say which Ian reviewed a little while ago there’s no incentive to sign up. Normally survey websites make promises and wild claims to the benefits of signing up to their service. They’ll make promises like receiving products through your front door to test out for companies or earn lots of cash. In my experience this is all bogus. You’ll be very lucky to earn more than $1 per hour with survey sites. But what does MyView promise you? I think there must be something wrong with me because every survey website I sign up to I am told I am not eligible to complete any. Maybe I am not “the average consumer” and companies don’t want my opinion on any of their products or services. But I did manage to earn some points. I found a section of my profile where I earned 350 MyView points for completing. These are the only points I can currently earn. What Can I Spend My Limited Points On? Well here I am again shocked. With sites similar to this you are able to cash out a certain amount of points for dollars. I won’t get into the low earning potential again but when the conversion of points to cash is so high you are only earning $0.17 per hour for the surveys you are filling out, you can see why Ian and I cannot stand it when people recommend survey sites as a method of earning money online. But what can I spend MyView points on? It seems you are only able to cash them out as a donation to Doctors without Borders. As you can see in the image above I have set the filter to show everything and these are the only rewards I can cash out on. Even though it’s a noble cause but do you want to spend hours and hours filling out surveys just to donate $20 to Doctors without Borders? I certainly don’t. If I could give MyView a lower rating I would. Not only is their homepage terrible at telling you what the benefits of joining are, even though it’s nice not to see a flashy sales page, but once you are inside there isn’t much there. You are limited in the amount of surveys you can complete, or in my case none, which means you can’t earn a decent amount of points to spend. And if you did finally earn enough points to spend, you can only make donations towards a charity. There are plenty of other methods for earning money online and filling out surveys isn’t one of them. Not just with MyView but with any survey website. Well what should you be doing instead then? I’d suggest checking out our review of Swagbucks, a free site that over-delivers on all of their sales claims and doesn’t waste your time for pennies. I was extremely blunt in this review but you can see why. Websites like this are just a waste of time and effort. Have you found yourself angry and frustrated after signing up to a survey website? Have you signed up to MyView and had a different experience to me? Well I’d love to hear from all of you out there that feel the same hatred to websites like this or if you feel the complete opposite. Is there anyone out there that has had a good experience with survey websites? I suspect they’re almost non-existent. Description: About as close to a “scam” as paid survey sites get. 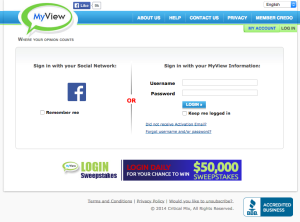 MyView satisfies almost none of their promises and leaves a lot to be desired. Well I was kicking along on MyView doing surveys. Earned enough for 2 gift cards which I haven’t used yet. Suddenly Jan. 1st I find myself with the same message “there are no more surveys for you. Check back.” Still nothing after almost a month. Surveys are a waste of time except for a few rare sites. Weird. I’ve been with them for a long time and have had no trouble racking up points. I like that they give 100 points even if you don’t qualify for a survey. They have a big selection of giftcards. I usually get the Amazon or Macy’s ones. I just cashed out a $50 this month, and last time was last December. I currently have a balance of 85,000. Maybe you’re the wrong demographic? I’m a stay at home mom who usually qualifies for grocery surveys. I do a lot of different companies and don’t find this one any worse than any of the other ones! 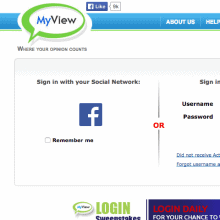 I have been with MyView for about 5 years now. I get to do lots of surveys and every couple of months I get enough for a $20 Wish Card. In terms of spam I have had popups from this website and no spam from MyView. valued Opinions on average payout between $100 and $300 month and have done so for many many years. Recently, they have slowed up offering surveys, but always receive Gift cards within hours from requesting them. PureProfile probably atm the easiest and most efficient survey site, only negative they only pay out $50.00 every 60 days. guess it helps the site stay alive and member can almost always look forward to 50 bucks every 60 days. Beware also of Myopinions.com.au who claim to pay rewards for doing their surveys – they do not. When you have spent hours filling out their crappy surveys and earn enough points to claim then try to claim them they close down your account with a message “you have made a violation on the account” and after reading other reviews this happens to everyone. They cannot be contacted via email or phone.